Miller Homes’ latest development in the east, is positioned on the southern edge of Scotland’s bustling capital city. Less than a mile from the City Bypass, Highbrae at Lang Loan boasts quick access to Edinburgh’s vibrant shopping scene, world renowned theatres, live music venues and museums, as well as the beautiful, open green spaces surrounding the city. Closer to home, daily life is made easy with Straiton Retail Park which is home to an Asda, Next, Sainsbury’s and Ikea is close by. The vast and rolling Pentland Hills are also on the development’s doorstep, offering memorable walking experiences – particularly at this time of year, when the heather takes on wonderful winter hues. Straiton Pond Local Nature Reserve provides plenty of exploring opportunities and King Acre golf course offers the chance to play a round of golf within scenic countryside all year round. 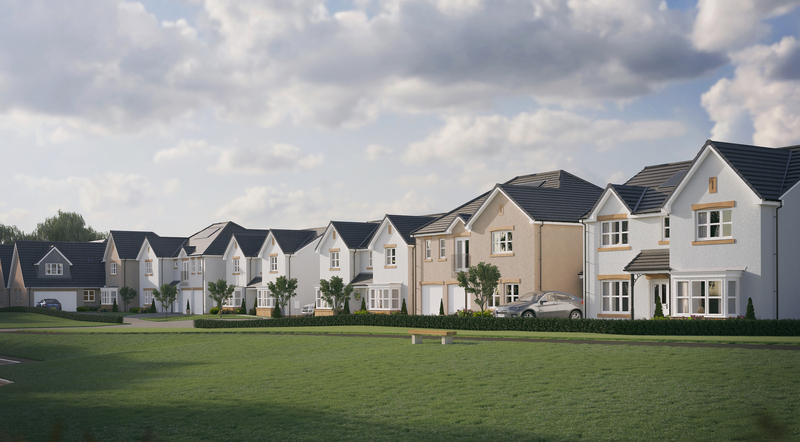 The development itself offers a contemporary selection of energy efficient four and five bedroom homes, perfectly positioned within the catchment area for great primary and secondary schools and just over two miles from the Edinburgh Royal Infirmary. Highbrae at Lang Loan is the first of the homebuilder’s developments to feature its new home styles, which cater to the needs of modern family life. The homes, which have been named after Scottish clans, have been designed to make the most of natural light and space. There are six new housetypes released for sale, all carefully designed to fit perfectly with how modern families live. Highbrae at Lang Loan has something for everyone, including the four bedroom Mackie with a stunning bay-windowed lounge to the elegant five bedroom Lockhart, with double garage, elegant winding staircase and standout master bedroom. The development also features the Mackintosh which is a great option for growing families. The welcoming entrance leads the way to a lounge, which is flooded with natural light from a stunning bay window. The impressive open plan kitchen and family area is perfect for modern life and entertaining and the addition of a contemporary kitchen island creates a space for cooking preparation and can be used as a stylish breakfast bar. An adjoining laundry room keeps everyday clutter at bay. A formal lounge, elegantly entered through double doors, and dining room are ideal for entertaining family and friends, and the flow of the downstairs space allows for an additional room at the front of the home, which makes for a great home office, a cosy den or even a playroom for little ones. A central landing leads the way to four bedrooms upstairs and a beautiful master bedroom, complete with double fitted wardrobes and private ensuite. Thoughtfully built with family living in mind, two of the bedrooms share a Jack and Jill ensuite and there is also a main bathroom, meaning there is plenty of room for a large or growing family. Also available at Highbrae at Lang Loan is the four bedroom Pringle, a beautiful home designed to give families the freedom and flexibility to make it their own. The Pringle features a lounge at the front of the home, with a contemporary bay window, and a modern open plan kitchen and family area downstairs, perfect for relaxing and entertaining guests. The laundry roon and a WC add practicality to the home without compromising its style. Upstairs there are fourbedrooms, one of which includes an ensuite shower room, and a family bathroom with separate bath and shower. A large window ensures that the master bedroom is filled with light, and the room also features a contemporary ensuite and stylish fitted wardrobes. Homes at Highbrae at Lang Loan are selling from nearby development, South Gilmerton Brae and Miller Homes is offering a £2,000 option voucher to personalise homes on all new homes reserved this year (until 31 Decemeber 2018), with a move-in date of before 31 March 2019. For more information call 03331 220 300 or pop into the marketing suite at South Gilmerton Brae from Thursday to Monday between 10.30am and 5.30pm.